Ever since I saw ROCK Racing put together multiple newbie teams at the 2011 Castlewood 8hr AR, I knew I wanted to do the same in 2012. 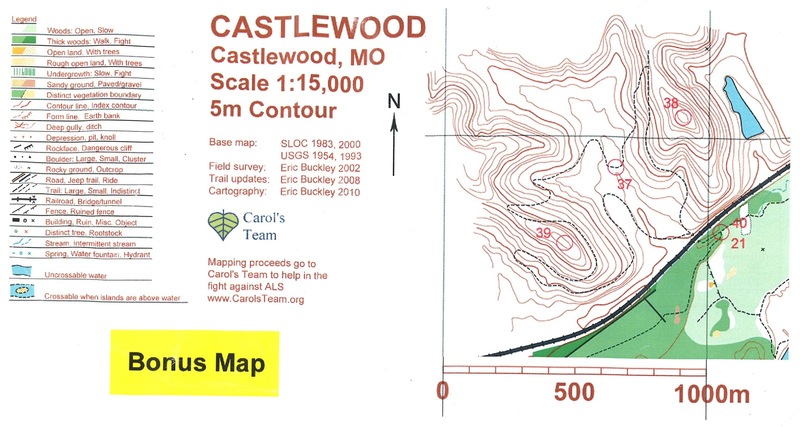 The Castlewood 8hr AR, put on by Bonk Hard Racing, is the perfect event for aspiring adventure racers in the Midwest. First, it's short: 8hrs is the advertised time but the course is complete-able in 4-5 hours for the winners and 5-6 hours for a decently fit team. 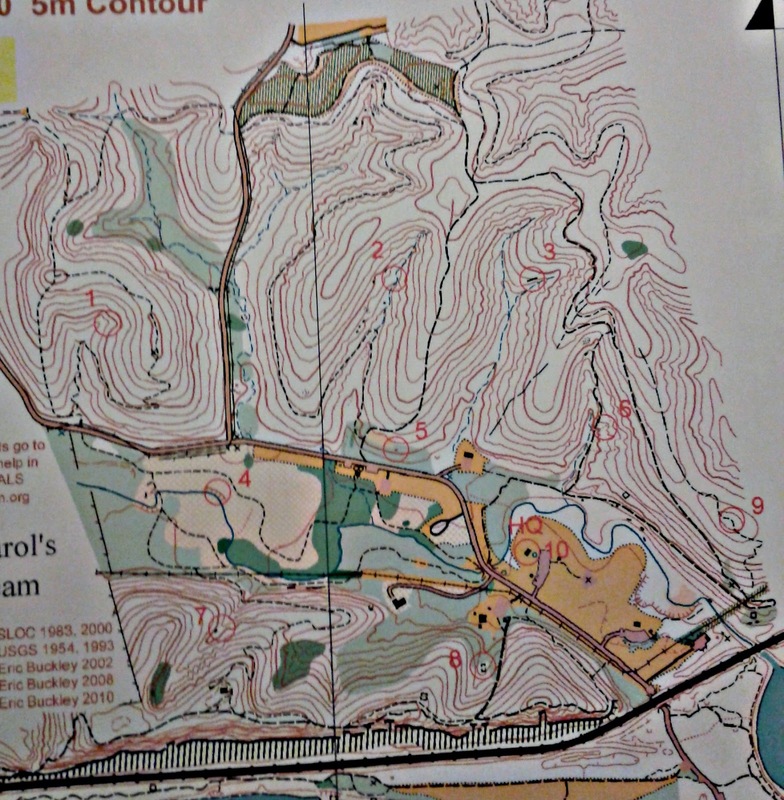 Second, it's designed for inexperienced racers - minimal UTM plotting, simple navigation with plenty of safe route choice options, and familiar terrain for anyone in the St. Louis area. Bonk Hard has done a great job at making this a "gateway race" for anyone remotely interested in adventure racing and I was excited to bring new faces to the start line. I teamed up three people associated with Pfoodman Racing: Young Ben, a totally rad newly-turned-17-year-old; Courtney, a supa-fast mountain bike/cyclocross chick who is extending her racing repertoire to endurance events; and Keith, a Pfriend of Pfoodman stoked for new experiences like running off-trail and paddling a canoe. 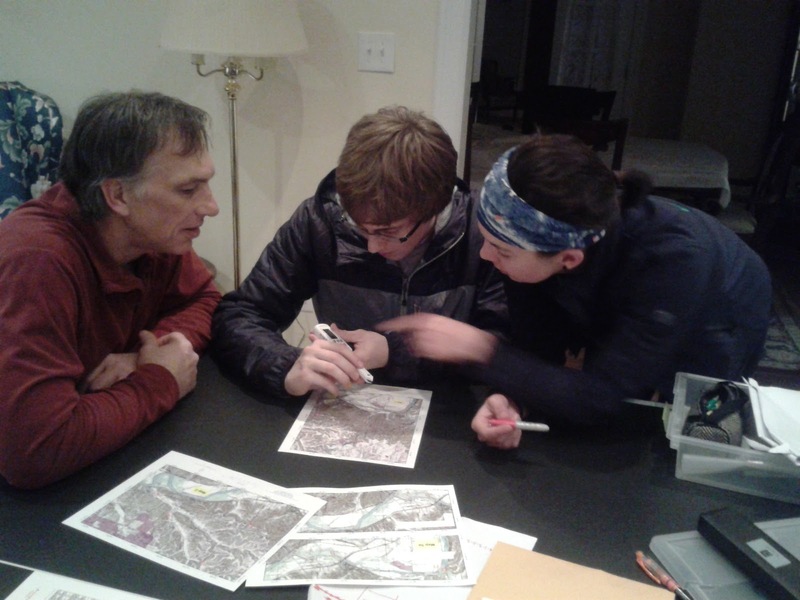 Me teaching Young Ben how to use the electronic mapping wheel, while Keith supervises. 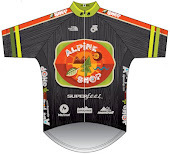 We all meet up at Alpine Shop for racer check-in on Friday night. We receive some very purple, very cool race shirts from Bonk Hard and Courtney and I get new Omni-Heat baselayers from Columbia for being among the first 20 women to check in. (There were 20 shirts for the men too but they had already been claimed.) We all pick up a little something from the shop with our 30% discount coupons...so nice! Then it's off to Dewey's Pizza for eating, plotting, and strategizing. When we get there, however, it's a bedlam with a 35-minute wait. Enter my AR buddy Bill, the navigator who I raced with for my entire first season! He tells us to get pizzas to-go and then come over to his house just a few blocks away for a quiet and spacious area to plan. How awesome! We take his advice and are soon stuffed with delicious pizza and plotting our routes. 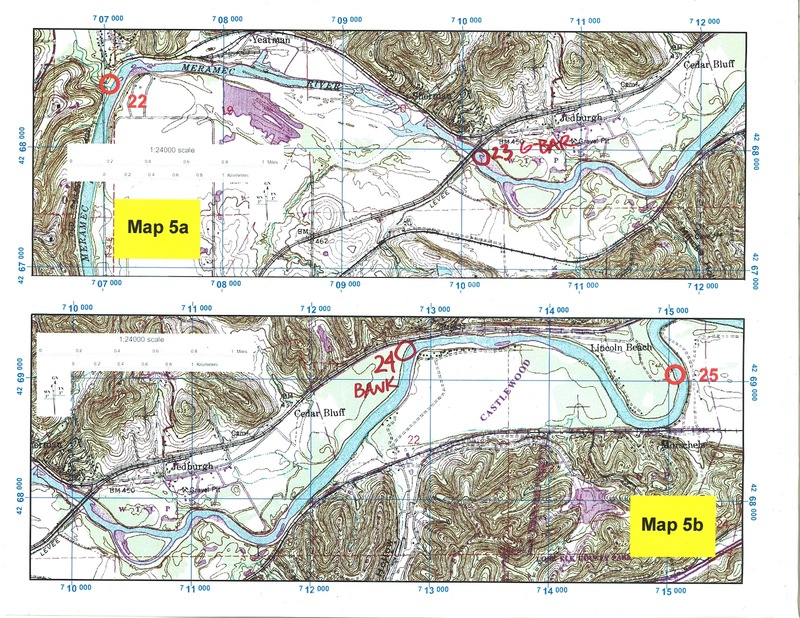 We have maps for the first trek, the first bike, and a good idea of the first paddle. 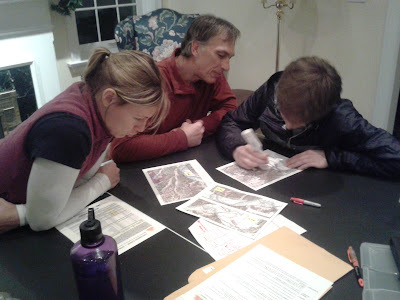 We talk about some last-minute strategy, gear lists, clothing choices, and at 8pm I send my new adventure racers home for packing and sleeping. It's a little weird to pack my own gear in my own apartment and then sleep in my own bed the night before a race - usually these things are done in a hotel room cramped with bikes, gear, and teammates. I miss that. Courtney is serious about route planning. Race morning is quite warm and calm - great weather for any race, let alone one in December! We meet up in the Pfoodman-favorite Ranger Lot at Castlewood State Park. Everyone is well-prepared and pretty soon we're dropping bikes off at the start/finish line and chatting with other teams. In fact, we're in the middle of a conversation with Alpine Shop (Jeff educating us about his self-made wrist-warmers) when Gary yells "GO!" and Doug has to remind everyone that there's a race starting. Trek 1: CPs 1-10, any order. Which way would you go? Typical AR start...people scattering in every direction! We had decided the night before to go 8-7-4-1-5-2-3-6-9-10. Turns out, most other teams decided that was a good route too so we are in a huge herd running to CP8. Young Ben punches and we stay low for the attack on CP7. CP4 gives us a little trouble since I'm not sure if the flag is on top of or below the bank, but Ben spots it high and we are fine. Then a quick climb up to CP1 and contouring down to the road for the fast run to CP5. 5 could have been a little tricky but there are two or three teams standing on the road right below it, acting like a billboard for us. Then we climb up to CP2, directly across the ridge for CP3, down a little via the trail for CP6, back up high for CP9, and a fun bushwhack and creek crossing to return back to CP10/HQ. Ben has been punching everything while Courtney, Keith and I stay lower and regroup after each CP. When we get back to HQ, there are still plenty of bikes around and we learn that we're in the top 10! I am so excited by this for a couple reasons: first, after my nav disaster a few weeks ago, I didn't make any big mistakes here; and second, my team as a whole is generally new to off-road running, and we seem to have paced it perfectly with no injuries. Score! TA from Trek 1 to Bike 1. I tell everyone to keep their layers on even though we're hot because we have 10 miles of fast pavement to tackle - our damp clothes will be cold on the bikes. So we get our shoes sorted and then take off down Kiefer Creek Road. I'm a little nervous about CP11 since I don't have that part of the map out, but we figure it out after one false stop and are on our way. CPs 12 and 13 are road junctions so no mistakes there. There is some climb to this route but reviewing things the night before I don't think there are any other options. CP 14 is on a paved downhill bike trail which we locate easy enough. CP15 is a little trickier - I'm navigating from memory at this point (didn't want to stop and re-arrange the maps) so all I can tell my team is the clue: "bridge". Turns out there are several bridges on this trail and I'm not sure which one it is. Fortunately, Young Ben has been here before so after we pass the last bridge without finding the punch, he suggests that we stop and check the maps. We do, and realize that we overshot the CP by about 400 meters. As we are checking the maps, The Happy Mutants blast past us, the only team to pass us so far. Backtracking, I count reentrants and at the correct bridge, we stop and look for the punch. It takes few minutes to realize it's hidden on the side of the bridge, but Ben punches and we are back on track, cruising to the west side of Castlewood on the Al Foster Trail. This section of the park always makes me nervous because there are lots of similar-looking trails, but we make it through just fine, riding on the flat and fast singletrack. Courtney, Keith, Ben, and me in transition. Photo by SuperKate! The nav to 38 is really simple...go uphill. Ben punches high as we cross paths with eventual winners 33 Down (my former teammate Sunny is their girl and they are rockin!). We also see Kuat and Bushwhacker hot on their heels. Horserace! I'm quite happy to stay out of the battle for first place - today is about (p)fun for the Pfast and the Pfurious! 37 is a little tricky because the small valley is full of unmapped brush (there was a note on the clue sheet warning of unmapped veg). But we just have to follow the streambed uphill a short way and then Ben spots the flag. 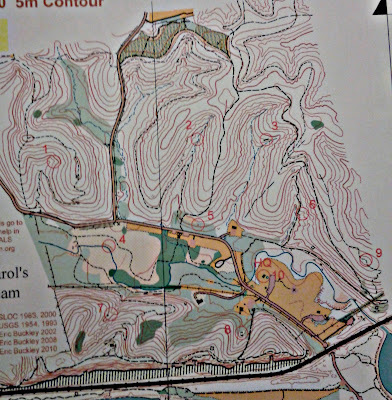 Then it's some trail running and uphill slogging to 39, again an easy punch. I wish I was wearing a Garmin for our route from 39 to 40 (back to our bikes). I had just planned to go downhill on a bearing, but Young Ben knew about lots of abandoned trails that would take us in the right direction. So I turn off my nav brain and let the 17-year-old lead the way. And he does a great job, making excellent use of relatively un-veggy (is that an adjective?) old trails that pop out exactly at the railroad tunnel. Awesome job Ben! Then we simply get back on our bikes and ride away towards the canoe put-in. Courtney and I rolling out of TA. Photo by SuperKate! This was a really easy leg, we ride the last little bit of singletrack out to the Al Foster, and then haul on the gravel path to the put-in near Glencoe. Once we arrive, we are greeted by two awesome Bonk Hard volunteers, Suzanne and Jackie, and given UTM coordinates for the next 2 paddle CPs. Ben and Keith take care of securing the bikes in the boats while Courtney and I plot. It takes a few extra minutes to make sure the bikes are stable (Courtney's lefty fork is a little bit tempermental), but since we are all riding really nice equipment, it's worth it to make sure we won't lose anything if we dump. I shove the first boat off with Courtney in front and Ben steering, and then hop in the back of the second boat with Keith. It takes a few minutes to remember how to steer a canoe with canoe paddles, but pretty soon we are tracking straight down the river. Courtney and Ben waiting just after the put-in. The whole paddle leg is...relaxing...an extremely far cry from the last time I was in a canoe. We all seem to ignore the fact that there is a race going on and instead just enjoy the December sunshine and warm temperatures. With my extremely limited canoeing knowledge, I give everyone a couple pointers and it's enough to make us stable on the river. I learn that Keith has never even been in a canoe before, let alone one with bikes in it! But we all manage just fine. We get passed by lots of teams but it's no big deal. It's a nice day, we haven't gone swimming, and we're still somewhat close to the front of the race. Me and Keith waiting at a CP while Happy Mutants pass. Courtney has the passport and punches 23 and 24 with ease. As we are making our way towards the take-out at the Castlewood boat ramp, my favorite moment of the race happens. Courtney and Ben are ahead of Keith and I when I see a few Pringles chips float by on the water. I glance up and notice that Courtney is munching away. Courtney running for the punch at CP23. "Courtney, quit littering chips or we're going to get penalized!" I call up ahead in a joking tone. Chips are bio-degradable and therefore not really litter, right? "Oh, I'm not littering, those chips are for the fish!" Courtney cheerfully calls back. Oh. Of course. How could I forget? Fish need to eat too! Courtney and Ben punching CP24. The paddle ends with me violently needing to pee (almost a repeat of Castlewood 2011) so as we reach the take-out I sprint up to the woods. It takes some time to get the bikes re-assembled, but we get things sorted and pass the gear check with flying colors. We are rewarded with the last map of the day: 7 CPs on the bikes. Last map of the day! With our route highlighted in orange. While I personally had been hoping for more trekking, a mountain bike leg is the best-case scenario for our team. 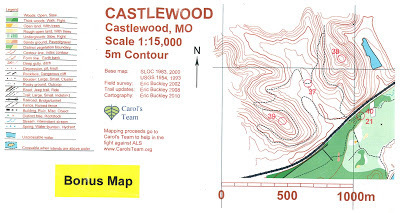 We are mountain bike racers, after all, and very familiar with the trail system at Castlewood. 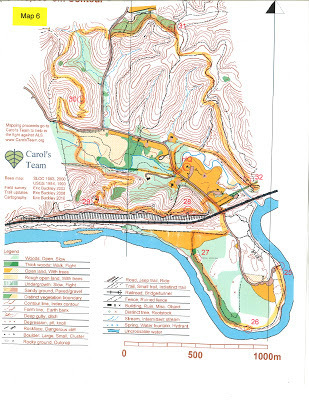 I nav the remainder of the race using trail names. Young Ben leads and I feel like a musher, commanding her team with ease. 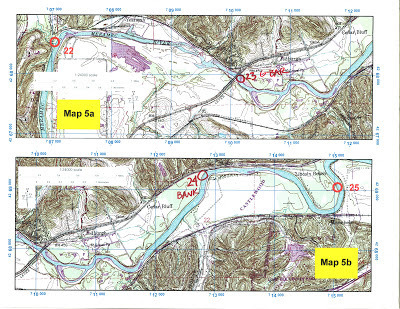 CP26: "bottom of River Scene"
CP27: "on the right just before the Dirt Crits field"
CP28: "left turn onto the connector to the back side of Lone Wolf"
CP29: "the ruin at the top of Lone Wolf"
CP30: "the bench at the top of Justin's"
CP31: "on the left at the end of the doubletrack after Ries"
CP32: "just before the switchback at the bottom of Grotpeter"
We hit all of these points cleanly. I am riding sweep (code for: I am the slowest on the team!) and often by the time I pull up to the CP, Ben has already found it and punched, and we are ready to ride again. We are machines! Courtney takes a digger on the log after the Lone Wolf switchbacks but pops up bravely and keeps on rolling. I share my mantra for whenever I crash: Jeff Sona would be proud. Because if you're not crashing every once in a while, you're not riding hard enough. When we punch CP32, I tell the team that it's our final CP and we just have to make it to the finish line. We're all a little surprised...done? Already? I'm thankful there are no teams behind us so we don't have to take any chances (side note: ask Alpine Shop about their sneaky bike-whack). We roll to the finish line as a happy team...The Pfast and the Pfurious! Lots of fun seeing you guys out there, and I'm pretty sure you've got 3 more AR converts!